What we set out to make, and what we ended up with were two different things, entirely, but the result was great. 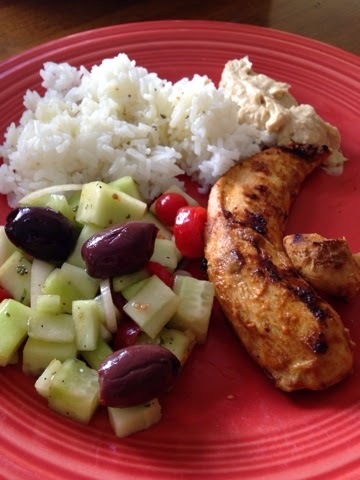 Grilled chicken tenders seasoned with a basic Chicken Shawarma recipe, (just the first part, not the sauce) but using a Masala Curry powder. This created a fabulous Indian spiced grilled chicken. The cucumber salad was lightly tossed in oil and parsley. The rice is dressed with a lemon olive oil and white wine sauce. To make the dressing, mix 6 tablespoons olive oil with juice of 1/2 lemon and 1 tablespoon of white wine. Mix in salt, pepper, and herbs to taste. Wisk well. We enjoyed this meal so much, that we did a repeat the next day. Click here for my hummus recipe (which accompanies this meal very nicely). Enjoy!